APTET Results 2019 - AP TET Paper I, Paper II(A), Paper II(B) Answer key, Results dates. 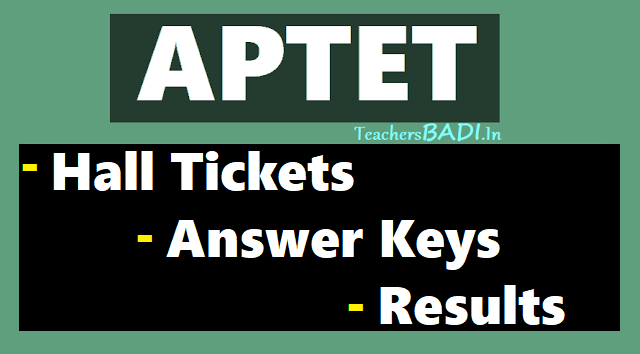 APTET Hall Tickets 2019, AP TET Hall Tickets 2019, APTET Results 2019, AP TET Results 2019, APTET Answer Key, APTET Preliminary Key, APTET Final Key, APTET Exam date. APTET 2019 Results available at aptet.apcfss.in: APTET Hall tickets 2019 is scheduled to be released on10th February 2019 on the official website of Commissioner of School Education, Government of AP - APTET 2019 aptet.apcfss.in. The official website reads the notification, “1.Download Hall Tickets: ...06.2019 onwards”, however, the Hall Tickets for Andhra Pradesh Teacher Eligibility Test (APTET 2019) have been released. Candidates who had applied to appear for APTET 2019 must keep a close watch on the official website and follow the instructions below to download their Hall Tickets as soon as it is released by CSE, Andhra Pradesh. "AP TET Results on ..-06-2019"
APTET 2019 Results: APTET 2019 Exam Results to be released on July .., 2019. Keep touch with this page to get your AP TET Marks sheet or TET Score card. The Andhra Pradesh Teacher Eligibility Test (APTET 2019) was successfully conducted by DSE board in the month of February 2019 by AP Government in all 13 Districts. AP TET Results along with AP TET Rank Card or AP TET Marks sheet will be released soon on its web portal. The tentative date for Andhra pradesh Teacher Eligibility test Results (AP TET Results 2019) will be on July .., 2019. AP TET Exam objective is to ensure National Standards and benchmark of Teacher quality in the recruitment process in accordance with the National Council for Teacher Education (NCTE). Candidates who are eagerly waiting for AP TET Results 2019 can now check at aptet website after announcement of AP TET 2019 Results are releasing on July .., 2019. by the Department Of School Education, AndhraPradesh. AP TET Results 2019, AP TET Score Card 2019, AP TET marks sheet, APTET Results Marks scheet and AP Teacher eligibility Test results 2019 soon after release by AP Government. APTET Results have been released. Conducting body, Commissioner of School Education has released the Andhra Pradesh Teacher Eligibility Test, APTET 2019 Results on July 2, 2019. The final APTET 2019 key was released on June .., a day prior to the scheduled day of release. APTET 2019 examination was conducted in two shifts and consisted of two papers - Paper 1 and Paper 2. Paper 1 was conducted from June ,,. Paper 2, conducted from June .., consisted of two papers - Paper A to test Maths, Science and Social Science and Paper B - Physical Education. APTET final keys and response sheets were released prior to the result declaration. Candidates should have been able to estimate their score. Steps to check APTET Results 2019 on alternative links: Log on to manabadi.co.in. Click on the link saying AP TET Results 2019 under date 02.06.2019. Cross the pop up asking for your mobile number as it might be used for marketing and advertising purposes by the website.Enter Hall ticket number and hit submit. The APTET result would be displayed on the screen. Save and take a print out for future reference. The objective of Andhra Pradesh Teacher Eligibility Test, APTET is to match up to the National Standards and benchmark of quality of teachers in the recruitment process in alignment with the guidelines laid down by National Council for Teacher Education, NCTE. After waiting, the Commissioner of School Education, CSE Andhra Pradesh has finally activated link of the download Hall Ticket or Admit Card for APTET 2019. The link activated is for Paper I and Paper III. The facility to download Admit Card for Paper II would be activated shortly. Candidates can click on the link provided here to Download APTET 2019 Admit Cards with the Steps to Download instructions below. Please note, the website is taking longer time due to heavy traffic. Candidates are hence advised to be patient. Andhra Pradesh Teacher Eligibility Test, APTET 2019 Admit Cards would be available at 10 pm on the official website aptet.apcfss.in. As per the official notification Candidates can download the admit cards for the examination from the link provided below. Steps to download the admit cards are also provided. Please note, the admit card for only Paper III has been released at the moment. The admit cards for Paper I and Paper II would be released. The links for the download have been provided here. They would be activated as and when the admit card is available. The Hall Tickets for Andhra Pradesh Teacher Eligibility Test (APTET 2019) were released on February 10 at the official websites – cse.ap.gov.in and aptet.apcfss.in. All those who are interested in appearing for this exam can download the Hall Tickets once released. According to the new schedule released by the Andhra Pradesh Commissionerate of School Education (CSE), the APTET 2019 exams will be held from June .., 2019. The AP TET 2019 exam will be held in two sessions; the first session will start from 9.30 am to 12. 00 noon while the second session will be held from 2.30 pm to 5.00 pm. Release date: APTET notification was released on 2019. Last date for apply: Online application process of APTET 2019 was conducted till May .., 2019. APTET 2019 final answer keys released, download at cse.ap.gov.in, aptet.apcfss.in. The final answer keys for the Andhra Pradesh Teacher Eligibility Test (APTET-2019) has been released on June 27, 2019. All the candidates who have appeared for the teacher eligibility test can download the respective paper answer keys through the official websites — cse.ap.gov.in and aptet.apcfss.in. The APTET 2019 is held from June 10 to June 21, 2019.The Paper I was conducted from June 10 to June 12, Paper II (A) from June 13 to June 19, and Paper II (B) on June 21, 2019. This year, a total of 3.97 lakh TET aspirants registered for their exam which was held in both morning and afternoon sessions. APTET is a computer-based test which is being conducted by Department of School Education, Government of Andhra Pradesh in all 13 districts of the state. It is held for all those aspiring to be teachers in state government, Mandal Parishad, Zilla Parishad, municipality, private aided schools and private un-aided schools in the state for Classes 1 to 8. APTET 2019 Results 2019 on June .. at aptet.apcfss.in: APTET 2019 Results for May examinations are scheduled to be released on June 30, 2019 on aptet.apcfss.in. Andhra Pradesh Teacher Eligibility Test, APTET May 2019 Results are scheduled to be released on June .., 2019. As per the official notification of APTET, the final answer keys for APTET May 2019 examinations would be released on June .., 2019. Candidates who qualify the APTET examination are eligible to apply for recruitment under the AP DSC 2019 examination. AP DSC 2019 notification is scheduled for release on July .., 2019 on the official website apdsc.cgg.gov.in. Candidates who have appeared for the APTET 2019 May examination are advised to note tha the last date to raise objections on the initial answer keys is June 26. The initial answer keys and question papers along with response sheets were released on the official website aptet.apcfss.in on June 22 and are available on the same. Final answer keys would be released on June .., 2019. Candidates are required to clear the AP TET to be qualified for the AP DSC examinations. The recruitment, however, is based on the AP DSC results. A total of 10,351 teachers would be recruited by means of AP DSC examination. APDSC 2019 would be conducted from June .., 2019. Andhra Pradesh TET Results declared; steps to download score card: Andhra Pradesh government has to be declared the AP TET results on June .., 2019 on the official website aptet.apcfss.in around 4 pm. The Final Answer Keys of the APTET 2019 examination has to be already released by the Commissioner of School Education, CSE Andhra Pradesh. Along with the AP TET 2019 results, AP TET Rank Card or AP TET Marks sheet will also be released. How To Check AP TET Results 2019-2020: Log on to the official website https://aptet.apcfss.in/., Look for for AP TET Results 2019-2019., Click on the AP TET Results 2019-2020 link., Enter your registration number and password., Click on the submit button., Your AP TET Result 2019-2019 will appear on the screen., Carefully check all your details., You can download it and take a printout for future reference. How to download APTET 2019 Hall Tickets? APTET 2019 Hall Tickets released today. Candidates who have registered for the exam can download the same from the official website. AP CSE has started releasing the official APTET 2019 hall tickets for the exams scheduled from June .., 2019. Those candidates who have applied for both papers (Paper I and Paper II or Paper I and Paper III) may have to download hall tickets. APTET candidates may download the separate hall tickets for separate papers now. The APTET 2019 will be conducted online in the 13 districts of Andhra Pradesh state. As it is happening right now, there is a chance that APTET hall tickets website may not respond when you try to access it. In such situations, the candidates are advised to access the APTET official website after sometime. According to APTET website, the applicants are advised to access the APTET 2019 hall tickets either from Mozila Firefox or Internet Explorer desktop browsers. Note: APTET 2019 Hall Ticket /AP TET Admit Cards Released @ Aptet.apcfss.in (Cse.ap.gov.in): Candidates can download their Hall Tickets from the website at cse.ap.gov.in or directly from aptet.apcfss.in. In case of any candidate could not download the Hall ticket he/ she should contact the Joint Director, TET of Commissioner of School Education, Anjaneya Towers, Ibrahimpatnam between 10.00 AM to 5.30 PM on all working hours in person only giving details of the journal number of the fee paid, reference number of the application submitted, a copy of the printout of the Application form and one photograph (same photograph as pasted on the application form). Request for issue of duplicate Hall Ticket will not be entertained after the examination in any case. Teaching job aspirants should also note that CBSE is likely to come out with CTET 2019 notification in March. According APTET 2019 official notification, all questions will be Multiple Choice Questions (MCQs), each carrying One Mark, with four alternatives out of which One Answer will be correct. There will be no Negative Marking. There will be Two Papers for the APTET 2019. APTET Paper-I will be for a person who intends to be a teacher for Classes I to V, Paper-II and Paper III will be for a person who intends to be a teacher for Classes VI to VIII. A person who intends to be a Teacher either for Classes I to V or for Classes VI to VIII shall have to appear in both Papers (Paper I and Paper II). In APTET Paper I(SGTs) (for Classes I to V), Paper II(SAs) and Paper III(LPs), number of MCQs will be 150 and the duration of examination will be 2 and half hours. The APTET question paper shall be bilingual (i.e). English followed by the language-I chosen by the candidates for all languages except Sanskrit. For the candidates choosing Sanskrit, the questions shall be in Telugu followed by Sanskrit (Devanagari Script).